Buffet, Cafe or SUBWAY®?? This blog is all about how to travel 5 Star on a dime…. and we do. More recently we have incorporated SUBWAY® into our travels since they have restaurants in 102 countries!!! Bet you didn’t know that. They have more restaurant locations than any other chain worldwide. Eat Fresh! We all know SUBWAY® is healthier than fast food, great to bring to sporting events and to the beach of course, but did you know that you could save $32 per day on eating out for a family of four by choosing SUBWAY® for one of your meals? That’s a savings of $224 per week. The average cost to go out to lunch at a restaurant is about $12 per person with drink, tip and tax. Okay so you don’t want to eat at SUBWAY® every day, than eat there every other day and save $128 in a week. Our family enjoys sitting down to fine dining for hours but we also like to grab something on the go that is healthy. When traveling from plane, to train, to ship and rental car sometimes you just need to grab something quick and easy that you can eat on the go or pack away for later. But then how do you please 4 different appetites you say? I like wheat bread but the kids prefer white . Our daughter won’t eat mayonnaise, mustard or any veggies other than pickles and olives. SUBWAY® will be more than happy to make it half one way and half another and even better, they will wrap each half separately. Did you know that they serve nearly 2,800 sandwiches and salads every minute? What’s in it for the kids? SUBWAY FRESH FIT FOR KIDS™ meals are great for kids because they include a freshly made sandwich on a mini sub roll, a SUBWAY FRESH FIT™ side choice of sliced apples and a drink choice of 1% low-fat white milk or a 100% juice box. Fresh Fit Sandwiches: There are 8 sandwiches which have been certified by the American Heart Association. SUBWAY® is the first restaurant to earn The American Heart Association heart check and for that reason ALONE, this is why I chose to write this post. Look for the red heart with the white check mark inside. Those are the Fresh Fit choices which consist of: Black Forest Ham, Oven Roasted Chicken, Roast Beef, Subway Club, Sweet Onion Chicken Teriyaki, Turkey Breast, Turkey Breast and Black Forest Ham, and Veggie Delight. Here’s what I love, SUBWAY® offers freshly brewed, non-sweetened ice tea, bottled water, 1% milk and VitaminWater!! This is a great option for our family, as we do not drink soda. In addition, they offer healthy choices such as apple slices and Baked Lays. Pizza gets old fast and it’s so greasy! Don’t get me wrong, we love pizza. 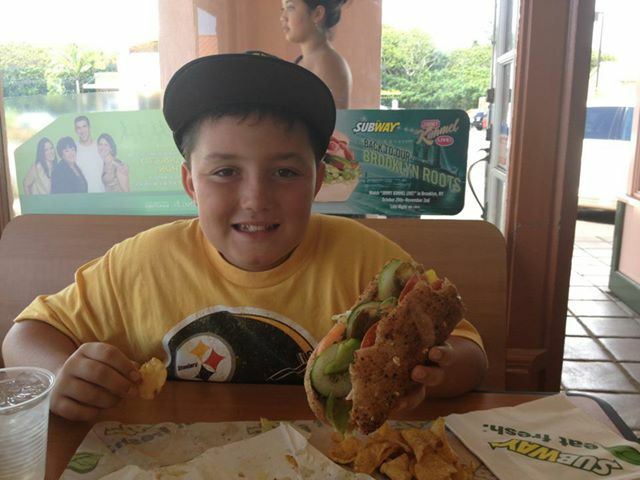 At SUBWAY® our family of four splits two $5.00 foot long’s. That is only $10.00 and then another $1.50 or so each for drinks. 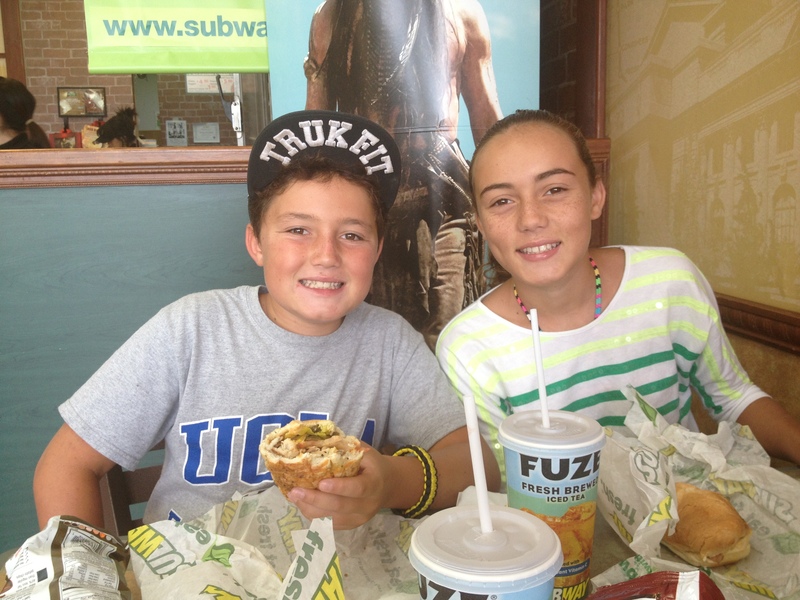 We love to grab SUBWAY® for lunch but it’s great anytime. They even offer breakfast!! At breakfast, you have the option of 3 different breakfast sandwiches made with egg whites for under 200 calories (steak, egg white and cheese/ egg white and cheese/ black forest ham, egg white and cheese). Even better, breakfast is only $3.00 and includes a coffee or 21 oz. fountain drink of your choice. You can’t even buy a coffee for $3.00 at your local coffee chain! Our favorite thing to do is grab a sub while on a long car ride and take it with us. Then each person can eat when they are hungry. All SUBWAY®’s are fairly consistent when it comes to pricing. We live on Kauai and the sandwiches are more like $6/$7 foot long’s but that is still very cheap. Tired of sandwiches? Try the chopped salad which includes tasty chicken, turkey and roast beef, plus fresh garden veggies like crisp spinach and crunchy cucumbers. 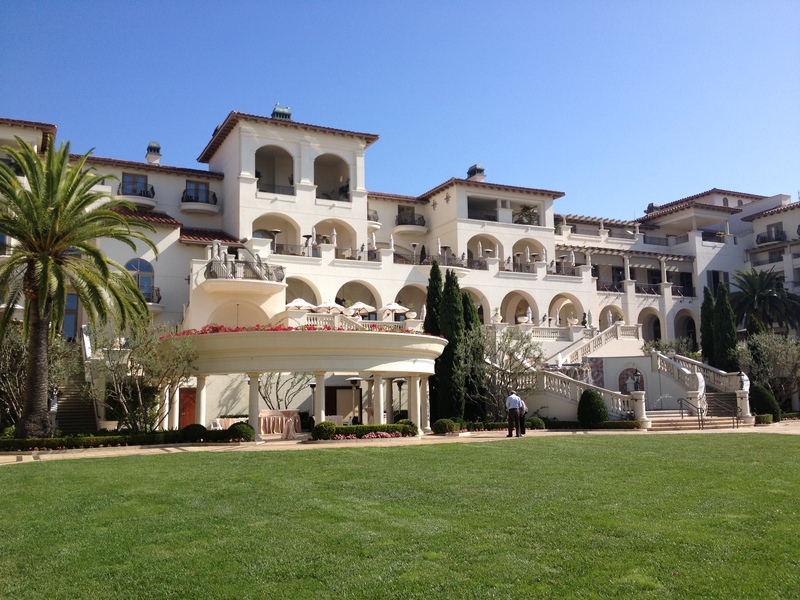 Last year we took a family trip to Laguna Niguel, California and stayed at the St. Regis Monarch Beach which was fabulous. We only ate one meal at the hotel as it adds up for four people real fast. We stopped at the local SUBWAY® located in the Plaza de La Paz Shopping Center more than once and picked up sandwiches to bring back to the hotel. In fact, we ate sub sandwiches as we watched the election on T.V. SUBWAY® brand maintains the same menu worldwide; however, menus do change in order to accommodate the different dietary needs of consumers where appropriate. In India, the population is largely Hindu and do not eat beef, or Muslim who don’t consume pork, these ingredients are substituted with chicken, lamb, or turkey. Customers can add or eliminate ingredients based on their own dietary needs since all sandwiches are made to order. In 1997, SUBWAY® introduces 7 under 6™ menu, featuring seven sandwiches with 6 grams of fat or less. In 2000, SUBWAY® makes the biggest change to its menu by introducing four gourmet sauces and seasoned breads. In 2007, SUBWAY® launches its Fresh Fit® and Fresh Fit for Kids™ meals. In 2010, SUBWAY® offers a variety of breakfast options which include sandwiches and melts, with the choice of egg whites or whole eggs, veggies, toppings, and sauces. In 2011 SUBWAY® introduced avocado to their menus, a super food. In 2012 SUBWAY® brand was recognized as the “Most Loved Fast Food Chain in the US” by YouGov’s BrandIndex Buzz Rankings. The American Heart Association’s awarded a Heart Check Certification on a number of menu items and meals at SUBWAY® restaurants.